Camel coat small obsession continues with another color mix - light blue denim and pops of tangerine-. It is a perfect combination for a winter day or in my case a rainy day. Is just me, or the camel color is the new black in "coats section"? Nothing better than the classics! Denim over denim and a camel coat. You look wonderful. You look stunning and this coat is everything! Fabulous! The coat gives your jeans outfit such a stylish look. But your red coat and matching lipstick are the icing on the cake. Amazing! Stunning coat and outfit! You are gorgeous and very stylish! 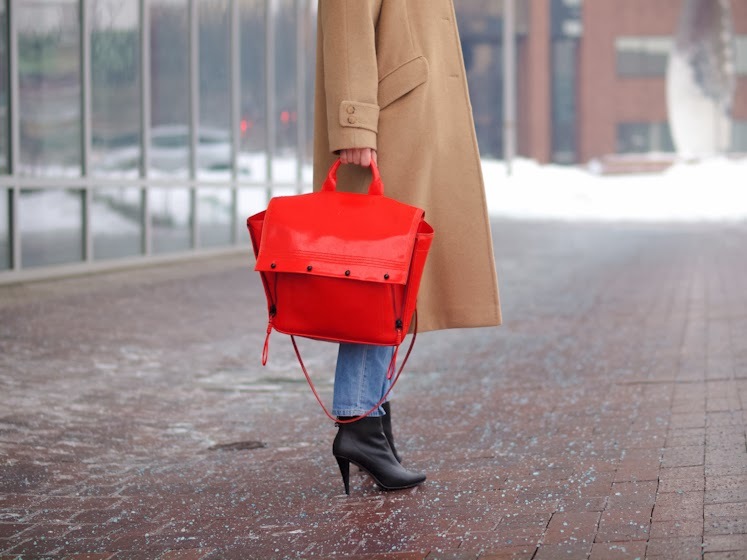 Love this camel coat with the pop of red! Nice look pretty. I have a Giveaways on my blog now where you can win a MakeUp Set. I will be happy to see you participating. Kiss from Italy. Much more love to your coat!!! Another winter uniform that is born in the most elegant mind.Yours!